SABATON - HEROES LTD. EDIT. (DIGI-BOOK) | Online Shop | Wizard LTD. Album: "HEROES LTD. EDIT. (DIGI-BOOK)"
Heroes are back with a vengeance! As a whole, "Heroes" serves compelling mixture of epic metal anthems, carried out by ultra-powerful guitar riffs, pounding drums, catchy choruses, "rough-meets-melody" kind of vocals and incomparable solos - not forgetting totally new level of intensity and bombastic sound quality, thanks to a world-famous producer and Sabaton's long-time guardian angel Peter Tagtgren. 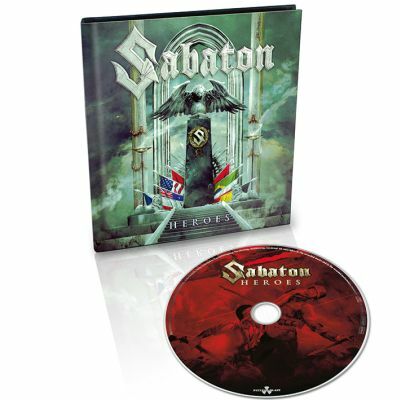 "Heroes" definitely introduces Sabaton more varied and dynamically wider than ever before, but at the same time, fresh-sounding new record still possess every imaginable element that you may expect from these heroic northmen. After hearing "Heroes", it's definitely not exaggerating to inform that Sabaton has taken some mighty steps after the band's core musicians - vocalist/composer Joakim Broden and bassist/manager Par Sundstrom - were joined by totally new blood (guitarists Chris Rorland and Thobbe Englund and drummer Hannes van Dahl) after career-defining "Carolus Rex" was recorded during 2011/2012. If you ever had any doubts regarding new line-up's abilities, "Heroes" will blast your suspicions to outer space if not further.